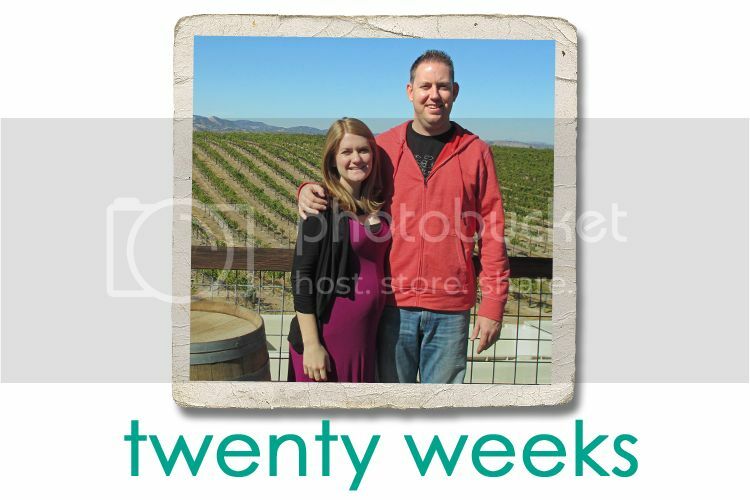 Jordy Liz Blogs: Twenty weeks. We are halfway there, me and you. At twenty weeks, it's a milestone that the first half is behind us and the second half is ahead. We have five more months to get ready for your arrival. Some days that seems like eternity and some days that seems like not enough. But we're ready for you. I think you're going to be spoiled. Not by us, per say, but by your grandparents, aunts, uncles, the like. You are not even here yet and you've accumulated baskets upon baskets of burp cloths, clothes, toys, and blankets. And your dad bought you a huge elephant the other night at Target because you had to have it. So, he may spoil you, too. We've spent this twentieth week in Paso Robles, California - wine country. While I can't partake in the actual wine tasting, I've enjoyed the gorgeous scenery, perfect weather, and extra time with your dad and friends. It's been a nice getaway and I look forward to getting back here with your dad one day. At five months in, I am feeling pretty good. I'm definitely ready for bed by the end of the day, but I feel energetic throughout the day. I am sure that will change over the next few months, so I'm taking advantage of it now. In the next month, we'll be working on your nursery, buying your furniture and finalizing a few details here and there. You are popping! :) Love it.